I2C (Inter-Integrated Circuit) is one of the most commonly used serial bus for interfacing sensors and other chips, and use two signals (Clock and Data) to control up to 128 chips thanks to its 7-bi address scheme [Update: That’s the theory, as in practice it’s limited to a dozen devices max. due to capacitive load, see comments]. 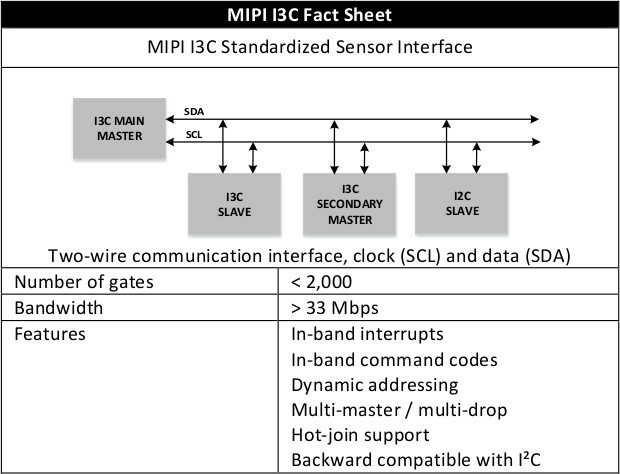 After announcing it was working of a new I3C standard in 2014, the MIPI Alliance has now formally introduced the MIPI I3C (Improved Inter Integrated Circuit) Standardized Sensor Interface, a backward compatible update to I2C with lower power consumption, and higher bitrate allowing it to be used for applications typically relying on SPI too. 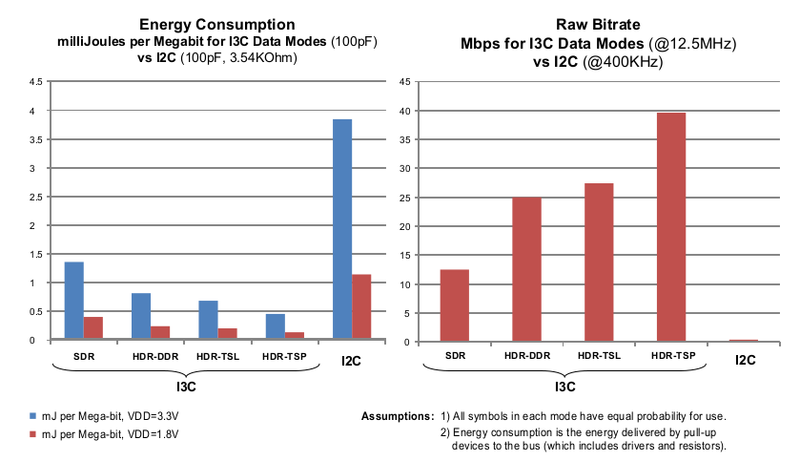 I3C offers four data transfer modes that, on maximum base clock of 12.5MHz, provide a raw bitrate of 12.5 Mbps in the baseline SDR default mode, and 25, 27.5 and 39.5 Mbps, respectively in the HDR modes. After excluding transaction control bytes, the effective data bitrates achieved are 11.1,20, 23.5 and 33.3 Mbps. The MIPI Alliance has also provided a table comparing I3C, I2C, and SPI features, advantages and disadvantages. You’ll find more technical details by downloading MIPI I3C specifications and/or whitepaper (free email registration required). Note that only MIPI member can have access to the complete specifications. Only full members can have full access to the spec? So much for hoping for wide adoption. Something a little bit confusing. In the comparison section at the bottom it says that one limitation of I3C is it still has 7 bit addressing like I2C. It then goes on to say that a single I3C bus could only support “to around a dozen devices”. If you can only support a dozen devices then it doesn’t really matter if you still have 7 bit addressing. You certainly won’t need any more than that. Assuming the 7 bit addressing limitation is the same as with I2C, the problem that manufacturers of I3C chips only have 7 bits of addressing to choose from. What this means is that consumers of these chips will still run the possibility of having conflicting addresses on their bus. i.e. a Flash chip and accelerometer that have the same address cannot exist on the same bus together. PCB designers will still have to ensure their devices are unique and with only 128 possible addresses for the entire world, there is a high likely hood that 2 devices you choose might conflict for your PCB. I understand what you are saying but my experience is that many devices have the ability to change addresses (either through addressing pins or writing to a register a new address). 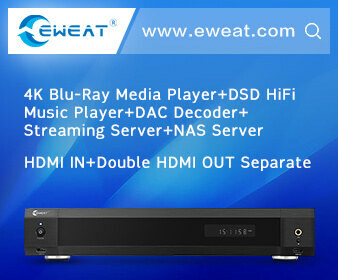 The worst case is to put the conflicting devices behind a mux. Hi – Melanie from MIPI Alliance here. I wanted to alleviate any concerns related to 7-bit addressing by sharing that the working group included Dynamic Addressing. That is good to know. Thanks for the update. With dynamic addressing I would say the 7 bit addressing in the “disadvantaged” column isn’t all that much of a disadvantage. Does that means only 11 slave devices to work simultaneously on one given I3C bus? I think is too few maybe not enough for quick developing smartphones, can you share you opinion? thanks. MIPI I3C specifications are now open to all on MIPI website linked above. However, I can see see different member specifications and public specifications. @cnxsoftware. Several previous comments have raised questions about the first paragraph where it says I3C can “…control up to 128 chips thanks to its 7-bi address scheme”. While the article is generally very good, those comments are correct in considering this a misleading lead. With a capacitive load on the bus of 50 pF, and each device contributing between 5-10 pF, the practical limit on chips on a bus will be between 5 and 10 (probably lower due to trace capacitance.) This isn’t called out explicitly in the spec, but is a natural consequence of the specified maximum values for Cb and Ci.